Recommended citation: Brox BW, Day DJ, Ellenbroek BA. Haplo-Insufficiency or Knockout of the Serotonin Transporter Does not Affect Heroin Self-Administration but Decreases BDNF in the Frontal Cortex . OBM Neurobiology 2018;2(2):010; doi:10.21926/obm.neurobiol.1802010. Background: Drug addiction places a heavy burden on those affected by it but only a small percentage of individuals (~20%), regardless of their drug of abuse, go on to develop the compulsive behaviours that define drug addiction. Clinical studies have shown that genetic variations that reduce serotonin transporter (SERT) activity increase the vulnerability to developing a variety of psychiatric disorders such as depression, anxiety and drug addiction. Methods: To investigate the influence of reduced SERT function in the laboratory, we studied the effects of heroin self-administration in a SERT knockout rat model. Groups of homozygous knockout (HOM), heterozygous (HET) or wild type (WT) animals completed a series of heroin self-administration experiments. In addition, quantitative reverse transcription polymerase chain reaction was used to measure relative abundance of brain derived neurotrophic factor (BDNF) transcripts of in the frontal cortex and striatum in animals that had previously self-administered heroin. Results: There were no differences between the genotypes for acquisition, maintenance and progressive ratio responding for heroin self-administration. However, relative expression of total BDNF and the BDNF III and BDNF VI isoforms were significantly decreased in the frontal cortex of animals that had self-administered heroin for all genotypes, however, no differences in BDNF expression were found in RNA isolated from the striatum relative to untreated control animals. Conclusions: These data suggest that reduced SERT function does not augment the reinforcing properties of heroin and support the hypothesis that different classes of addictive substances act through different neurobiological pathways. Addiction to drugs of abuse is a ubiquitous, worldwide phenomenon that places a tremendous financial and psychological burden on society, families and the individual. Unfortunately, only about 1 in 6 “addicts” seek help in the clinic and the majority of these do not achieve a successful outcome. This has led research groups to continue studying the complex interplay of behavioural and neurochemical changes that accompany drug addiction in an effort to better inform treatment programs for humans . Interestingly, only approximately 20% of individuals who use drugs of abuse go on to develop the compulsive behaviours that define addiction . Clinical studies have shown that there is a subset of the population with a genetically determined reduction in the serotonin transporter (SERT) that increases vulnerability for developing psychiatric disorders such as anxiety, depression and drug addiction [3,4,5]. Due to the relatively common incidence of this polymorphism and its relationship to other psychiatric illnesses, such as depression and anxiety disorders that often co-occur with drug addiction, it may represent an important avenue for understanding why some individuals develop addiction to drugs of abuse while others do not. To systematically investigate the influence of reduced serotonin transporter function in the laboratory we studied the behaviour of SERT knockout rats . In line with the clinical evidence, it has previously been demonstrated that compromised serotonergic function in the homozygous knockout animals (HOM) led to an increase in cocaine induced locomotion as well as facilitated conditioned place preference and cocaine self-administration . Moreover, we recently showed that these animals also show greatly facilitated 3, 4-methylenedioxymethamphetamine (MDMA) self-administration compared to wildtype (WT) animals . While these data provide support for the notion that a genetic reduction in SERT function enhances the reinforcing properties of drugs of abuse, all drugs of abuse initially lead to stimulation of dopamine release, although different classes of drugs do so via different mechanisms. Broadly speaking, psychostimulants, such as cocaine, (meth) amphetamine and MDMA directly inhibit and/or reverse the dopamine transporter, thus leading to an impulse independent increase in dopamine release. On the other hand, drugs such as nicotine and opioids act predominantly in the ventral tegmental area, thereby enhancing the firing rate of dopaminergic cells and increasing dopamine release in an impulse dependent manner. It has been suggested that this difference in drug mechanism of action is accompanied by several other important differences . Therefore, to better understand the interaction between reduced SERT function and the development of addictive behaviours, we investigated whether HOM (and HET) rats were also more sensitive to the reinforcing properties of the opiate heroin using a self-administration paradigm. While drug addiction is normally defined in terms of behavioural changes, it is also associated with long term functional changes in brain chemistry and connectivity. It has been hypothesised that drug addiction represents changes in synaptic plasticity, with neuronal connections in the dopaminergic system becoming inflexible and ultimately leading to habitual drug intake . Synaptic plasticity encompasses a variety of processes in different structures throughout the brain, with neurotrophic factors having an important role in the neurological changes that underlie learning and memory . In particular, the brain derived neurotrophic factor (BDNF) family of proteins has been implicated in synaptic transmission, neurogenesis and importantly, the synaptic plasticity that coincides with learning , and drug addiction . For example, several studies have shown that BDNF mRNA levels in rats were increased in several brain structures (e.g. striatum, nucleus accumbens) after a single injection of cocaine [13,14], or MDMA . Moreover, SERT HOM KO rats, show a reduction in total BDNF mRNA expression in the hippocampus and prefrontal cortex . There are multiple isoforms of BDNF expressed in the brain  but the exact function of these isoforms has not been elucidated although there is some evidence that specific BDNF transcripts may be more relevant for drug addiction. SERT HOM rats show specific reductions in transcript III, IV, VI and IXa in the hippocampus, and IV and VI in the prefrontal cortex . In normal (WT) rats, Liu et al. (2006) demonstrated that mRNA levels of BDNF isoform IV were significantly increased in the striatum after acute cocaine administration . Additionally, isoform IV was found to be increased in the medial prefrontal during cocaine abstinence , while isoform I was increased in the ventral tegmental area . Therefore, to understand how heroin, a drug that induces an impulse dependent increase in dopamine release, may interact with reduced SERT function we investigated changes in total BDNF and individual BDNF isoforms (III, IV, VI, and IXa) in the frontal cortex and striatum to evaluate specific drug induced neuroadaptations. Subjects were male Wistar rats (HOM, HET and WT). Breeding occurred in the vivarium at Victoria University of Wellington and animals were housed in groups until they underwent the surgical procedure described below. Before surgery animals were isolated and housed individually in a temperature (19-21 °C) and humidity (55%) controlled room that was maintained on a 12 hour light-dark phase with lights on at 0700. For the molecular analysis, we additionally used a group of drug naïve rats. These were handled several days before dissection, but did not undergo surgery or self-administration training. Testing occurred during the light phase beginning each day at 0700 when animals were transferred from their home cages to the experimental room. Food and water was available ad libitum except during testing. Experimental procedures were reviewed and approved (15 June 2012) by the Animal Ethics Committee at Victoria University of Wellington (Application ID: 2012R13). Surgery. Groups of 13-15 animals, per genotype, underwent surgery. Subjects were anesthetised and an indwelling catheter was implanted in the right jugular vein. Analgesia (carprofen 5.0 mg kg-1) was administered immediately before surgery and the subject’s eyes were swabbed with Lacrilube. The area over the right jugular vein was shaved and cleansed. Through a small incision the jugular vein was isolated and tied off and a length of tubing was inserted through a small cut made in the vein. The distal portion of the tubing was passed subcutaneously to an exposed portion of the skull where it was secured with four jeweller’s screws and acrylic dental paste. All incisions were treated topically with Terramycin and electrolytes were administered. Postoperatively, subjects were treated with carprofen (5.0 mg kg-1) (s.c.) for two days and their catheters were flushed daily with 0.2 mL of a sterile solution containing heparin (30 IU mL-1) and penicillin G potassium (250,000 IU mL-1) to prevent infection and the formation of clots. Subjects recovered for 5-7 days after surgery (to return to pre-surgery weight) before they commenced drug self-administration. Apparatus. Before each session rats were weighed and flushed with 0.2 mL of a sterile solution containing heparin (30 IU mL-1) and penicillin G potassium (250,000 IU mL-1) before being transported to the testing room. Drug self-administration was carried out in Med Associates test chambers that were housed in sound attenuating boxes. The testing room was temperature (19-21 °C) and humidity (55%) controlled. Each box was equipped with two levers; the active lever delivered an infusion of the drug while presses on the inactive lever were only counted. Upon depression of the active lever 0.025 mL of heroin drug solution was delivered to the subject over 3 seconds via a Razel pump equipped with a 20 mL syringe and a light located above the lever was illuminated (for the duration of the infusion). The smaller volume, 0.025 mL, was used to ensure that animals were not taking drug too rapidly. In addition, a 30 second time out was added after each infusion where no infusion could be earned despite presses on the active lever. These procedures are common practice with narcotic drugs like heroin . Testing Schedule. Subjects were placed in the testing chambers on an FR1 schedule (one active lever press earns one infusion) for daily two hour self-administration sessions (0.05 mg kg-1 per infusion heroin). Subjects completed 15 self-administration sessions; then the dose was doubled (0.1 mg kg-1 per infusion heroin) until responding was stable (less than 20% variation in active lever responses on at least three consecutive days). When subjects met this criterion they were placed on an FR2 schedule and finally on an FR5 schedule (two and then five active lever presses earn an infusion, respectively). Next, subjects underwent progressive ratio testing where the number of presses for each subsequent infusion increased systematically (i.e. 1, 2, 4, 6, 9, 12 etc.) . This schedule was slightly modified: four breakpoints (2, 4, 9 and 12) at the beginning of the schedule were eliminated to decrease over-sedation at the start of the session . Progressive ratio testing was completed for three doses of heroin: 0.05 mg kg-1 per infusion, 0.1 mg kg-1 per infusion and 0.2 mg kg-1 per infusion. After the last progressive ratio dose animals completed one additional day on the FR5 schedule to resume normal responding. The next day subjects were euthanised via CO2 asphyxiation and brains were extracted and frozen immediately at -80 °C. Brains were taken at this point in the experiment to determine subsequent changes in BDNF protein expression that may be present after responding (progressive ratio). Drugs. Drug solutions for infusion were prepared by mixing Heroin HCl (BDG Synthesis, Wellington, New Zealand), in powder form, with heparinised saline. Before use intravenous drug solutions were clarified of impurities using hypophilic Minisart syringe filters and placed directly into sterile 20 mL syringes. Tissue Dissection. Brain tissue from the frontal cortex and striatum was extracted within 2 hours after the last progressive ratio session was completed. All procedures were performed on ice using RNAse treated equipment. Frozen tissue was sliced into 1.5 mm sections using a chilled aluminium brain cutting block as described by . Tissue sections were placed on a chilled glass dish and the frontal cortex and striatum were rapidly dissected and processed by the addition of 1 ml TRIzol reagent per 50-100 mg of tissue. Each sample was immediately homogenised and then frozen at -80 °C until required for RNA extraction. RNA Extraction. RNA was extracted as described by Sargeant (2008) using a combination of TRIzol and column based purification (GeneJet RNA Cleanup and Concentration Micro Kit, ISO9001/ISO14001, K0842). RNA concentration was determined using a ND-1000 “Nanodrop” spectrophotometer (Nanodrop, Wilmington, DE). Reverse Transcription. Reverse transcriptions were performed using the Superscript III kit and components (Invitrogen, Carlsbad, CA) and oligo dT20 for first strand synthesis according to the manufacturer’s instructions. Between 2 g and 3 g of total RNA was reverse transcribed in a volume of 20 L. Quantitative Reverse Transcription Polymerase Chain Reaction. Amplifications were performed in triplicate in a final volume of 25 µl. Master mixes containing Platinum SYBR Green qRT-PCR SuperMix-UDG (Bioline, Total Lab Systems, Auckland, NZ), cDNA (10% of the reverse transcription) and primers (0.2 µM) were prepared. The forward ( ) and reverse (-) primers used were: total BDNF ( ) AGCTGAGCGTGTGTGACAGT, (-) ACCCATGGGATTACACTTGG ; BDNF transcript III ( ) ATGCTTCATTGAGCCCAGTT, (-) GTGGACGTTTGCTTCTTTCA ; BDNF transcript IV ( ) TGCGAGTATTACCTCCGCCAT, (-) TCACGTGCTCAAAAGTGTCAG ; BDNF transcript VI ( ) TTGGGGCAGACGAGAAAGCGC, (-) TCACGTGCTCAAAAGTGTCAG ; BDNF transcript IXa ( ) TGGTGTCCCCAAGAAAGTAA, (-) CACGTGCTCAAAAGTGTCAG . A no template control and no reverse transcription control were included in all experiments. Amplification for qRT-PCR were performed as previously described [18,28] using a Bio-Rad CFX-96 Connect thermal cycler (Bio-Rad, Auckland, NZ). Melt curve analysis was conducted between 65 and 95 °C to confirm correct amplification of PCR products. Five BNDF targets were evaluated: total BDNF, BDNF transcript III, BDNF transcript IV, BDNF transcript VI and BDNF transcript IXa. Expression relative to two housekeeping genes, Cyclophilin A (Cyc A) and Hypoxanthine-guanine phosphoribosyl transferase (HPRT), was undertaken. 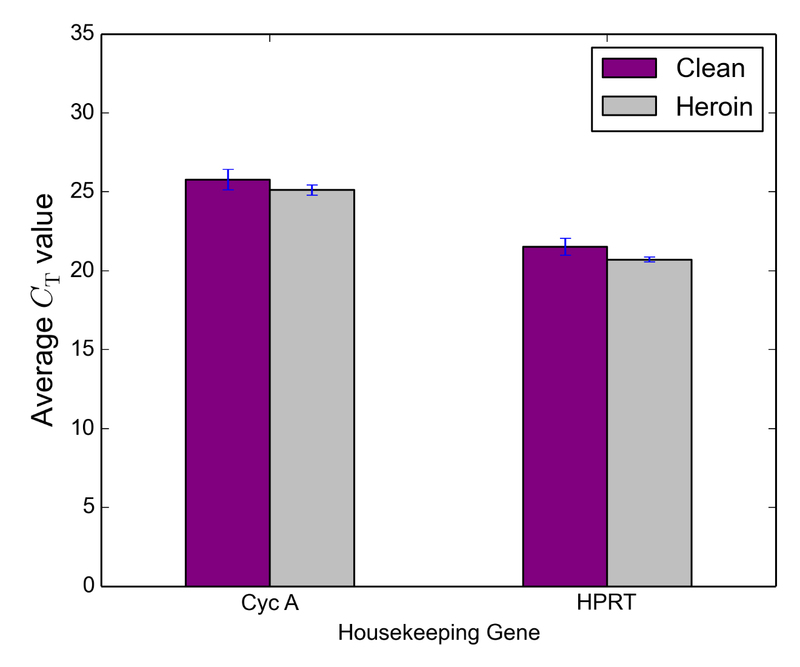 Relative gene expression was calculated using the comparative cycle threshold (CT) method  using Cyclophilin a and HPRT as housekeeping [30,31]. Data were analysed via two way ANOVAs with genotype and treatment as between-subjects variables. Subjects completed self-administration for 15 days (0.05 mg kg-1 per infusion heroin). When evaluating drug intake over this period a repeated measures ANOVA revealed no differences between the genotypes F (2, 22) = .72, p = .5; however, there was a significant main effect of Day F (14, 308) = 9.73, p < .001 with responding for all groups across days. The genotype*day interaction failed to reach significance F (28, 308) = .93, p = .57 (Figure 1). Figure 1 Initial drug intake for heroin self-administration for HOM (n=6), HET (n=5) and WT (n=7) groups. Active and inactive lever presses are given in Supplemental Figures S1 and S2, respectively. After initial responding the drug dose was doubled (0.05 to 0.1 mg kg-1 per infusion) and this transition was evaluated. A repeated measures ANOVA revealed a main effect of dose where groups, regardless of genotype, showed increased responding on the higher dose, F (1, 15) = 49.1, p < .001. However, both the genotype main effect and dose*genotype interaction failed to reach significance, F (2, 15) = 2.01, p = .17 F (2, 15) = .25, p = .79. To compare maintenance responding on fixed ratio schedules, FR1, FR2 and FR5, a repeated measures ANOVA was conducted which did not reveal a significant main effect of genotype F (2, 15) = 1.03, p = .38, or fixed ratio schedule F (2,30) = .95, p = .40 on lever presses. Additionally, the genotype*fixed ratio schedule interaction failed to reach significance F (4, 30) = 1.49, p = .23. (Figure 2). Figure 2 Maintenance responding for Heroin self-administration across varying fixed ratio schedules for HOM (n=6), HET (n=5) and WT (n=7) subjects. Active and inactive lever presses are given in Supplemental Figure S3. 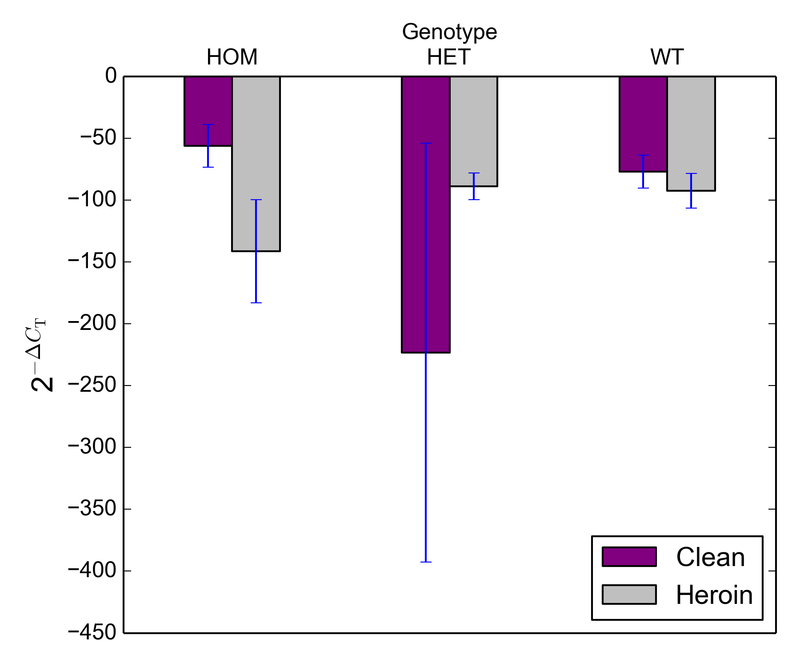 Figure 3 Average ( SEM) responding across varying heroin doses on a progressive ratio schedule for HOM (n=4), HET (n=5) and WT (n=7) subjects. Active and inactive lever presses are given in Supplemental Figure S4. Choice of Housekeeping Genes. To verify the suitability of the housekeeping genes for analysis of relative expression normalised to the amount of input RNA was examined in WT samples. Relative expression of Cyclophilin A and HPRT did not differ between treatments conditions when normalized to the amount of input RNA (Supplemental Figures S5 and S6). 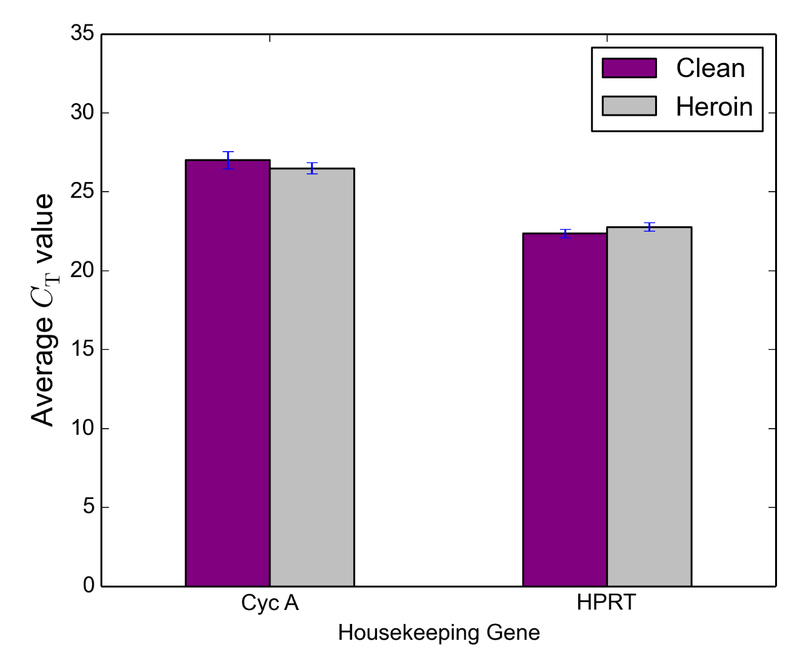 HPRT was deemed superior for relative analysis as a housekeeping gene as its relative expression was less variable than that of Cyclophilin A. Frontal Cortex. Data were analysed via two way ANOVAs with genotype and treatment as between-subjects variables (Figures 4a and 4b). Analysis of relative expression from untreated controls and heroin treated samples revealed a significant main effect of treatment for Total BDNF, F (1, 23) = 21.03, p < .001, BDNF transcript III, F (1, 23) = 4.83, p = .04, BDNF transcript VI, F (1, 23) = 12.3, p = .002 and BDNF transcript IXa, F (1, 23) = 9.19, p = .006 (see Supplementary Figures S7-S10 for each transcript across the genotypes). Genotype effects and interactions did not reach significance for Total BDNF, BDNF transcript III or BDNF transcript VI. However, there was a significant treatment*genotype interaction for BDNF transcript IXa, F (2, 23) = 4.8, p = .02. 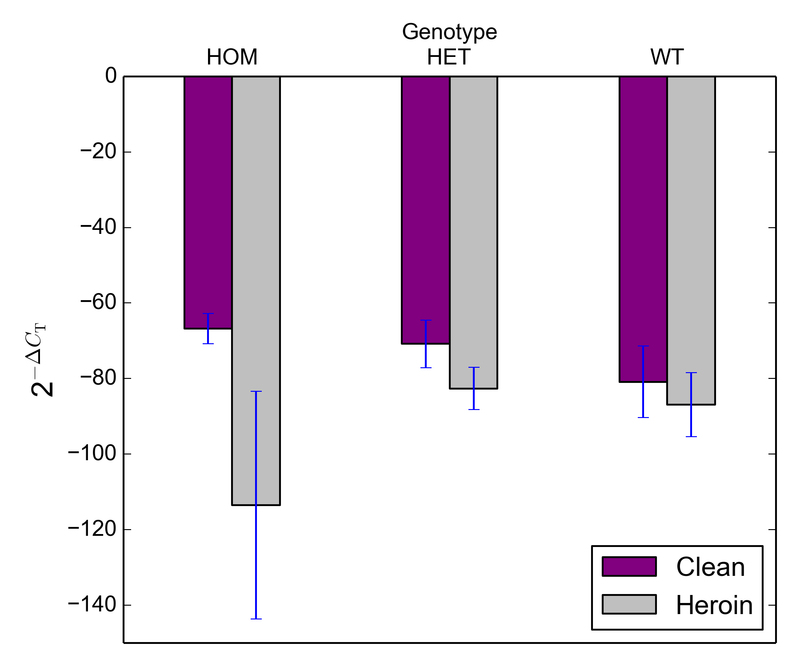 Post hoc comparisons revealed that HOM subjects treated with heroin showed a significant decrease in gene expression compared to those that were untreated (clean), t (7) = 2.46, p < 001. 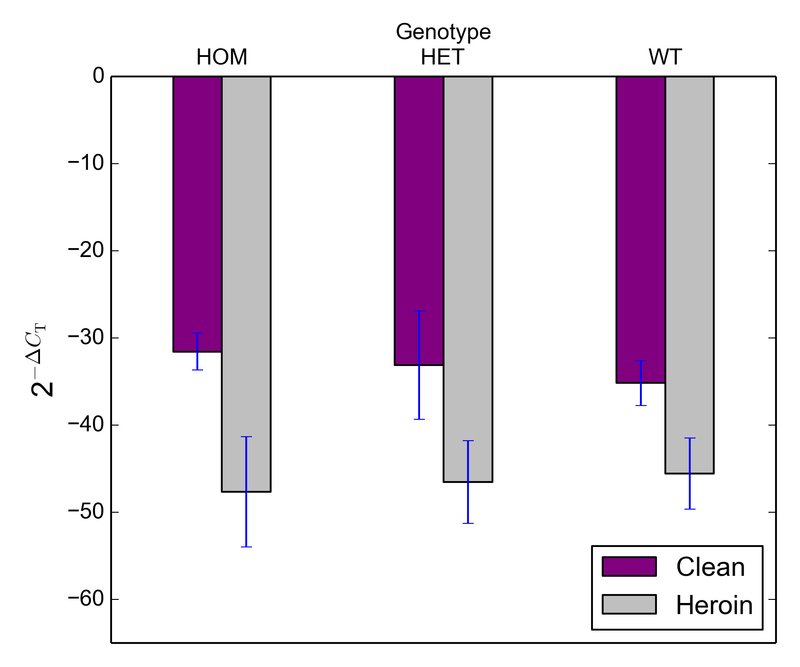 Comparisons for HET and WT subjects revealed no differences in gene expression across treatment groups (heroin vs clean), t (8) = .82, p = .44 and t (8) = 1.36, p = .21, respectively. Analysis failed to reveal a main effect of treatment for BDNF transcript IV, F (1, 23) = .03, p = .86 this was also true for genotype, F (2, 23) = .53, p = .59. Similarly, the treatment*genotype interaction failed to reach significance F (2, 23) = 1.13, p = .34. Striatum. A similar analysis total BDNF gene expression in tissue from the striatum did not reveal a significant main effect of treatment or genotype, and the treatment*genotype interaction failed to reach significance. This was also true for BDNF transcript III, BDNF transcript IV, BDNF transcript VI and BDNF transcript IXa (Figure 5). Figure 4a Target gene expression (BDNF Total, BDNF III, BDNF IV and BDNF VI) in the frontal cortex across control (clean) and heroin treated groups. Figure 4b Target gene expression (BDNF transcript IXa) in the frontal cortex across control (clean) and heroin treated groups. Figure 5 Target gene expression (BDNF Total, BDNF III, BDNF IV, BDNF VI and BDNF IXa) in the striatum across control (clean) and heroin treated groups. 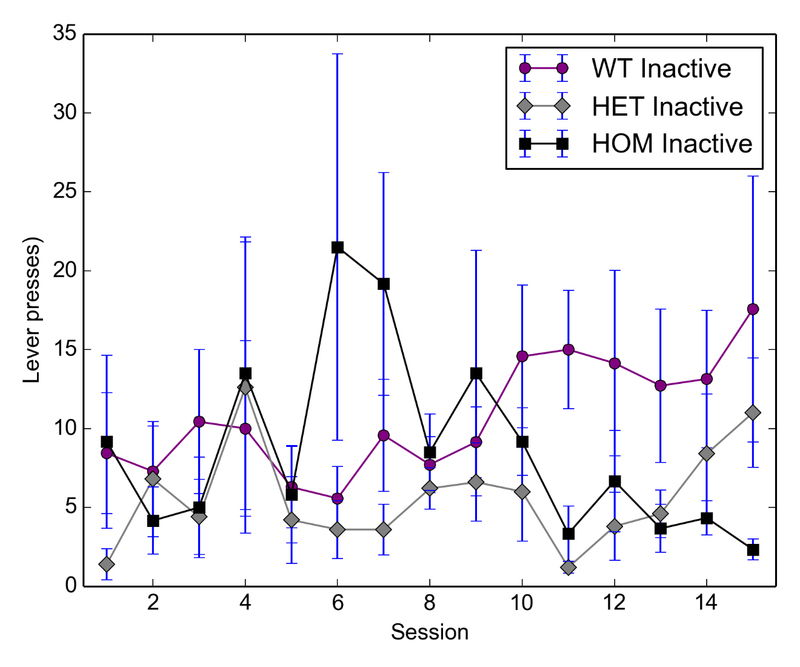 Our present study shows that HOM, HET and WT rats do not differ in the acquisition or maintenance of heroin self-administration. In addition mRNA expression levels of five BDNF isoforms in the frontal cortex and striatum were evaluated. While no significant effects for treatment were found for any of the genotypes for striatal tissue, heroin treatment led to a reduction in mRNA expression for total BDNF and isoforms III, VI and IXa in the frontal cortex. In contrast to our previous report , we did not find a decrease in BDNF isoforms IV and VI in the control HOM animals. Currently, this is difficult to explain, though it needs to be kept in mind that in differences in dissection (the frontal cortex in the present paper compared to the prefrontal cortex in the original report) may have contributed to the different findings. In addition, the current animals were considerably older than the original animals. Reduced expression of total BDNF and isoforms III and VI were found for all three genotypes but the reduction in expression of isoform IXa was only significant for HOM animals. One caveat of the present study is the fact that the control group did not undergo surgery or self-administration training. Thus it is not completely clear whether the changes in BDNF are related to the reinforcing properties of BDNF, to the handling or the learning component. However, our main focus was on the potential genetic differences, and given that the genotypes (both in the controls and the self-administration group) underwent the same procedure, we feel confident our conclusions are justified. Moreover, learning and handling in general, lead to increases in BDNF, whereas we found substantial decreases, further suggesting the effects are primarily related to the effects of heroin . While our data suggest that the positive reinforcing effects of heroin are not affected by a genetic deletion of the SERT, it is important to notice that 2 hour exposure to drugs such as heroin do not really induce compulsive (“addictive”) drug intake . Moreover, especially with respect to opioid addiction, an increase in negative reinforcement (i.e. enhanced withdrawal signs with repeated exposure) has been theorized to underlie the transition from recreational to compulsive drug use [33,34]. Given that SERT KO rats show an increase in anxiety and depression-like characteristics , it is conceivable that with extended access, SERT KO rats show an increased compulsive heroin intake. On the other hand, we recently found that SERT KO rats do not show an enhanced conditioned taste aversion response to heroin . In contrast to other studies that have examined cocaine and MDMA treatment in rats with a genetic reduction in [6,7], the SERT HOM rats were not more sensitive to the reinforcing properties of heroin. Therefore, our data add to the growing body of evidence reporting differences between classes of drugs that act on dopamine neurons via different pathways. For instance, it has been shown that animals that readily self-administer cocaine are not predisposed to self-administer morphine, and vice versa . Likewise, in humans, while compulsive amphetamine use leads to robust increases in impulsivity, heroin use does not [38,39]. Similarly, animal studies demonstrated that cocaine withdrawal was accompanied by increased impulsivity (i.e. inhibitory control) whereas heroin withdrawal did not lead to changes in impulsivity [40,41]. These behavioural differences between psychostimulants and opiates/opioids are mirrored by neurochemical differences. For example, specific 5-HT3 antagonists, ICS 205-930 and MDL 72222, block morphine- but not amphetamine induced conditioned place preference . Likewise, whereas the 5-HT4 antagonists GR 125487 and SB204070 prevented heroin induced DA release in the striatum, they did not affect amphetamine or cocaine induced dopamine release . Differential effects have also been described for 5-HT2 receptors. Thus, the 5-HT2A antagonist SR 46349B, inhibited amphetamine but not morphine induced DA release, while the reverse was seen with the 5-HT2B/2C antagonist SB 206553 . These studies (see Table 1) provide compelling evidence that psychostimulants and opioids have differential relationships with the serotonergic system. Our data further emphasise the differential role 5-HT plays in the reinforcing properties of drugs of abuse. Our data further emphasise the differential role 5-HT plays in the reinforcing properties of drugs of abuse but whether this is related to the impulse-dependent versus impulse independent nature of the dopamine release is unclear. Table 1 Specific 5-HT receptor interactions with psychostimulants and opioids. BDNF has been implicated in drug addiction as well as in the development of rats with a genetic reduction in the SERT . We therefore specifically examined animals that were still actively self-administering heroin, rather than focussing on the alterations seen after drug withdrawal. Heroin led to significant decreases in BDNF in the frontal cortex, but not in the striatum. In line with the behavioural data, most of these reductions were seen in all genotypes. It is possible that an effect in the striatum may have been masked due to inherent heterogeneity within this brain region. Several studies have documented the complex changes that occur within the striatum during the transition to drug addiction; first, dopaminergic activation shifts from the ventral to more dorsal portions of the striatum. Second, a critical change occurs within the dorsal striatum itself; control mediated by the dorsomedial striatum is ultimately shifted more laterally within the structure [46,47,48]. Therefore, considering we analysed the entire striatum subtle differences in subregions may have been obscured. On the other hand, our data seem to be in line with the study of  who reported that total BDNF expression in the nucleus accumbens did not change after forced drug abstinence from heroin. The same forced abstinence of heroin has been reported to cause an increase in total BDNF expression in the medial prefrontal cortex . Our data therefore suggest that increased BDNF expression after opioid withdrawal may be a re-bound reaction to decreases seen during self-administration. Moreover, our data provide additional detail by specifically showing that the reduction in total BDNF mRNA expression can be attributed to isoforms III, VI and IXa, but not in IV. So far very few studies have evaluated the role of individual BDNF isoforms in the behaviour of opiates. Recently, an increase in isoform I in the frontal cortex, but not isoform IX, was reported after spontaneous withdrawal of morphine . Although these data seem to be somewhat in contrast to our findings, it is important to note that we did not include isoform I in our analysis, and more importantly, the decrease we observed in isoform IXa was only seen in HOM but not WT rats. At present, it is difficult to find an explanation for the selective reduction in this BDNF isoform in HOM rats, given that none of the behavioural data show a genotype dependent effect of heroin and the role of isoform IXa in the frontal cortex is virtually unknown. We have provided evidence that, in contrast to cocaine and MDMA, rats with a genetic reduction in SERT protein do not show an enhanced sensitivity to the reinforcing properties of heroin. 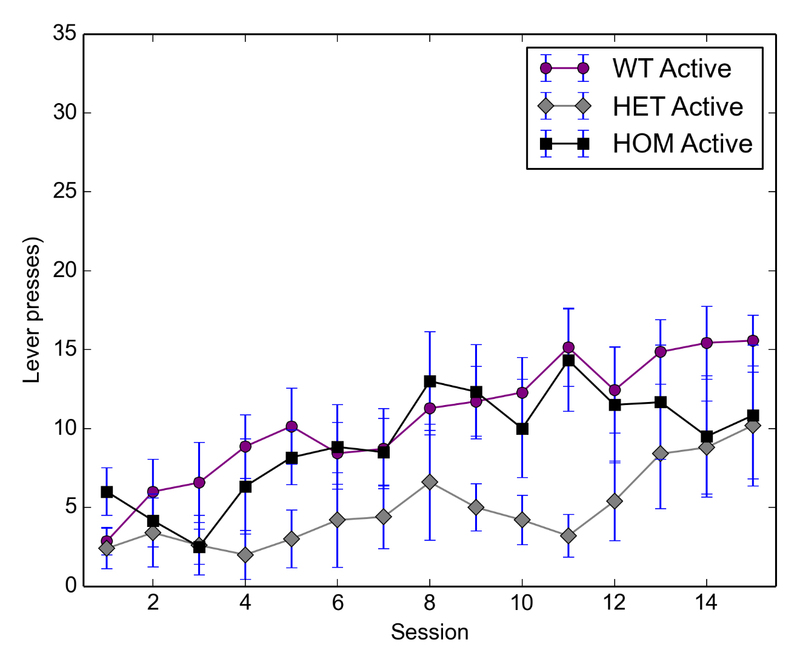 While the total number of animals in the present study was relatively small, the data are in line with our recent finding that SERT HOM and WT animals do not differ in heroin induced locomotor activity and conditioned taste aversion . These results indicate that there are important differences in the aetiology of drug addiction, depending on the mechanisms of action of the drug and adds to the growing body of literature that these two classes of drugs have fundamentally different properties. In addition, we found that rats that self-administer heroin show reduced levels of total BDNF and isoforms III, VI and IXa (but not IV) in the frontal cortex, while levels of all BDNF isoforms are unaltered in the striatum. The authors would like to extend thanks to Mr. Richard Moore, Mr. Peter Van Compernolle and Mr. Michael Roberts for providing day to day husbandry, support and care of the animals used in these experiments. We would also like to thank Dr. Joyce Colussi-Mas for providing training and guidance in the catheter implantation surgical technique. Lastly, the authors would like to acknowledge Mr. Varun Venkatesh for training and guidance in the quantitative reverse transcription polymerase chain reaction method and technique. The following additional materials are uploaded at the page of this paper. Figure S1: Initial drug intake (active lever presses) for heroin self-administration for HOM, HET and WT groups. Figure S2: Initial drug intake (inactive lever presses) for heroin self-administration for HOM, HET and WT groups. Figure S3: Maintenance responding (active and inactive lever presses) for heroin self-administration across varying fixed ratio schedules for HOM, HET and WT subjects. 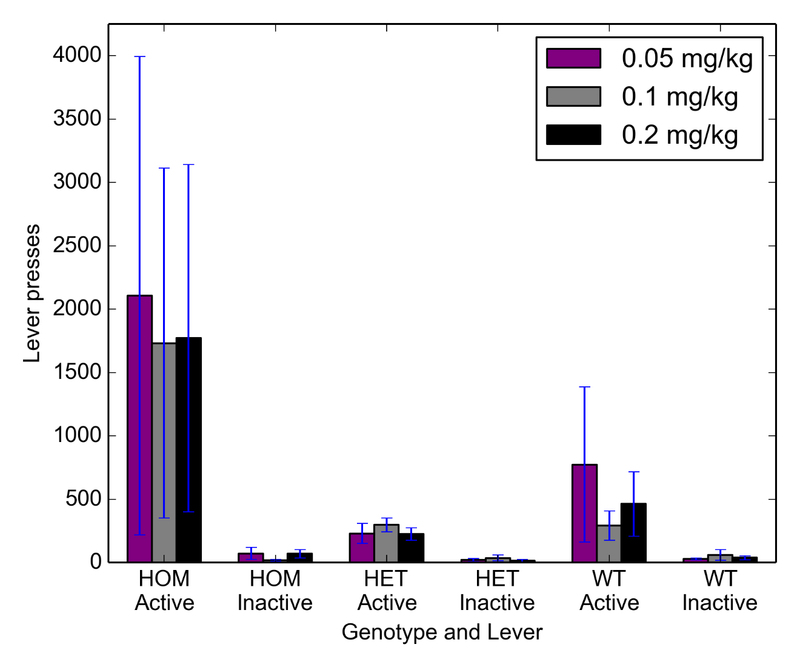 Figure S4: Progressive ratio responding (active and inactive lever presses) across varying heroin doses for HOM, HET and WT subjects. 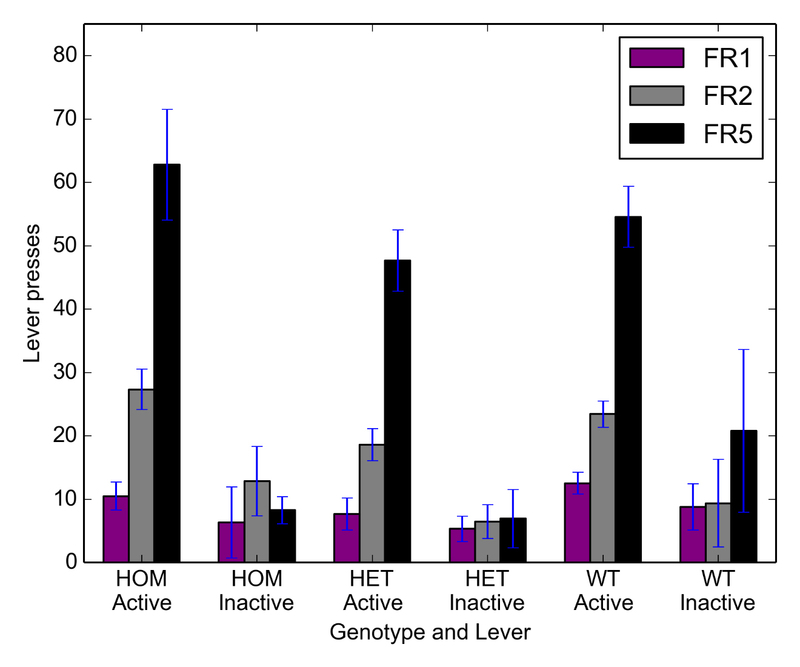 Figure S5: Housekeeping gene expression in the frontal cortex across control (clean) and heroin treated groups. 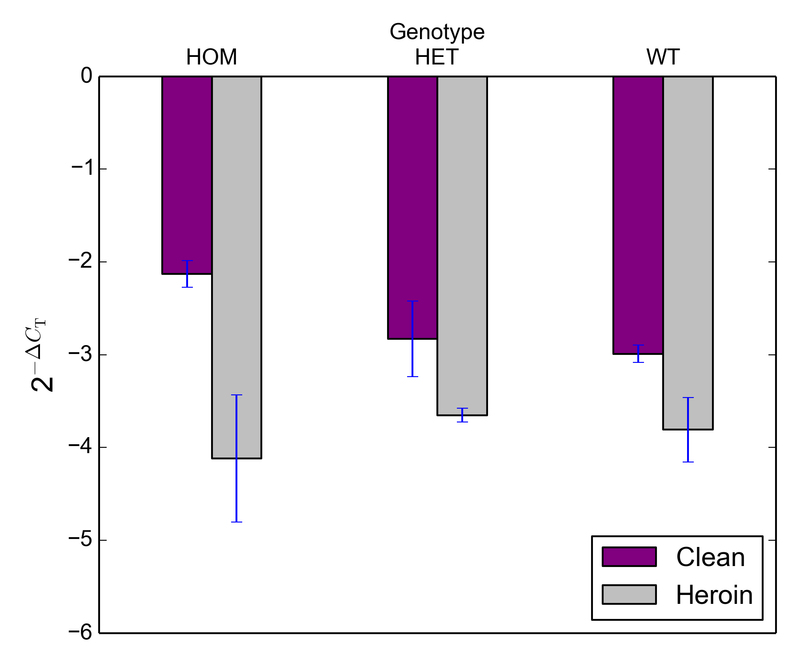 Figure S6: Housekeeping gene expression in the striatum across control (clean) and heroin treated groups. Figure S7: Target gene expression (total BDNF) in the frontal cortex across control (clean) and heroin treated groups. Figure S8: Target gene expression (BDNF transcript III) in the frontal cortex across control (clean) and heroin treated groups. Figure S9: Target gene expression (BDNF transcript IV) in the frontal cortex across control (clean) and heroin treated groups. Figure S10: Target gene expression (BDNF transcript VI) in the frontal cortex across control (clean) and heroin treated groups. Bridget Brox contributed to this work by planning experiments, collecting data, data analysis and writing the first draft of this manuscript. Darren Day contributed to this work by advising in planning the molecular experiments and supported the final revision of this manuscript. Lastly, Bart Ellenbroek contributed to this work by advising in designing and planning the behavioural experiments, data analysis and supported the final revision of this manuscript. No external funding was provided for this research. UNODC. World Drug Report 2014. 2014. Deroche-Gamonet V, Piazza PV. Transition to Addiction[M]. Encyclopedia of Behavioral Neuroscience. 2010. Sargeant TJ. The effect of opiates on the developing cerebral cortex. 2008. Brox BW, Ellenbroek BA. A genetic reduction in the serotonin transporter differentially influences MDMA and heroin induced behaviours. Psychopharmacol (Berl). 2018.